1. To preserve Middle Eastern cultural traditions. 2. To foster cultural pluralism in Israeli society. 3. To create a bridge for peace with the Arab world. The center is the only institution in the whole world to address the full range of Middle Eastern music traditions on an academic level. The center offers a program of study encompassing different vocal and instrumental traditions which evolved in the Middle East over the centuries, from North Africa in the West to Central Asia and India in the East. 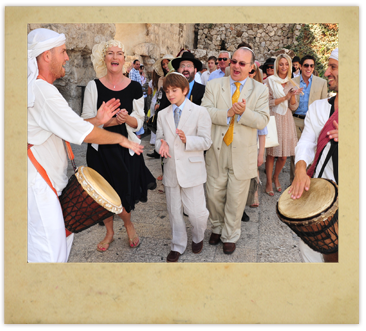 The curriculum places special emphasis on the wealth of traditions developed by the Jewish communities of the Middle East and the unique interplay of religious and secular influences. 1. Learning to play Middle Eastern instruments: Oud, Violin, Baghlama, Tar, Nei, Santur, Darbuka, Zarb and more. 2. Studying a variety of singing styles: Arab, Persian, Andalusian, Ladino and more. 3. Theoretical studies: music theory, history of music, music appreciation, etc. 4. Participating in chamber ensembles. 5. Composition for advanced students: writing new works based on the fundamentals of classical Middle Eastern music including: Arabic, Persian, Indian, Turkish, Jewish, Greek and Flamenco cultures. The center now has many students enrolled in various departments. The center has a Students Ensemble which will further the center`s goals by performing concerts for the Ministry of Education and appearing on radio and television from time to time, playing classical repertoire. In summary, the true face of Middle Eastern culture will be conveyed to the Israeli public for the first time in the history of the state, through its classical music. This tradition is deeply ingrained in the countries of the Middle East and will enhance our perceptions in other cultural spheres, such as poetry, literature and architecture. Presenting the Middle East in this light will help Israel to become a more integrated society and may even lead to better relations with our Arab neighbors. 1. The center is preparing a detailed high school matriculation program for the Ministry of Education and a first of its kind methodological textbook for the teaching of Middle Eastern music theory that will serve as a guide for introducing this subject in the Israeli school system. 2. The center has developed an educational concert series focusing on Middle Eastern Jewish music for introducing this subject in the Israeli school system. 3. The center has prepared a television series on classical Middle Eastern Music to be broadcast on TV`s culture and science channel. 4. The center has a teacher – training program for teachers of Middle Eastern classical music in the Israeli school system. הטופס נשלח בהצלחה, אשוב אליכם בהקדם.